At longs last! The UFC President himself unveiled what lies ahead for the promotion. Is UFC really going to have its own network soon? Or the banner will become bigger and better? The cat’s already put of the bag! 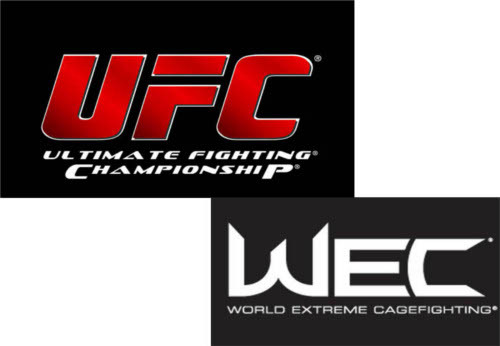 UFC President, Dana White, announced during a media call last Thursday that the promotion will be absorbing WEC starting next year. Here are some details of the major announcement. 1. Jose Aldo will automatically be the UFC Featherweight Champion, and he is penciled to defend his title at UFC 125 versus a soon-to-be-announced opponent. 2. The WEC 53 will be the last WEC event there will be. The winner of the Bantamweight title fight between Dominick Cruz and Scott Jorgensen will be the UFC Bantamweight Champion. As for the lightweight match between Ben Henderson and Anthony Pettis, whoever wins will be the next contender of the Frankie Edgar versus Gray Maynard winner at UFC 125. 3. UFC got a new four-fight deal on Versus for next year. 4. The promotion has no plans of adding more women or a Super Heavyweight division. But an Ultimate Fighter season with featherweight and bantamweight is in the horizon. 7. There’s no official statement as to whether Brittney Palmer will also be absorbed in the promotion. But the current Octagon Girl pit could certainly use her. Albeit this is indeed a major news for the fans, Dana White declined to discuss whether the promotion will have its own UFC network soon. Still, there’s a reason to pop a bottle of bubbly for more title fights in the pay-per-views, and hefty paychecks for the small tykes. More information will surely emerge, so don’t forget to check back.